Now that I am working from home, I quickly realized that I need my own space. I love my family, but a gal needs a place where she can have her own thoughts without being interrupted every 10 minutes by the dog wanting to be petted or the kid wanting a PB&J sandwich. We just so happened to have an extra bedroom, so I decided to convert in into my office. 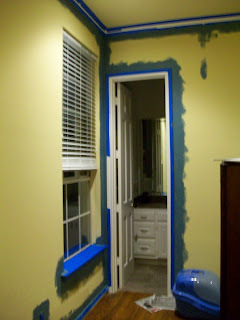 The room was supposed to be a nursery, hence the yellow color. And since I am not a baby, I wanted to change it to a more professional, sophisticated color that would make me want to be in there all the time! Normally, I would just hire workers to swoop in and paint it for me. But now that I am having to be thrifty and all (grrrr) I decided to paint it myself. How hard can it be, right? I watch HGTV shows like "Design on a Dime" and "Divine Design" and those people crank out a room up to Architectural Digest standards in 8 hours. 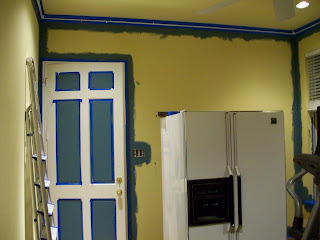 So, I picked out colors and headed off to the paint store to buy painters tape, paint, brushes, etc. Little Man was dying to "help" so after I taped off the room, I let him paint around the bottom of the room while I got up on the ladder to paint around the ceiling and the door frames. 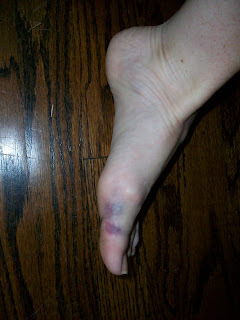 At one point, I was coming down the ladder and I must have shifted wrong because the ladder scooted across the hard-wood floors throwing me off balance and I fell about 4 feet down the ladder. Landed right on my tail bone and had to work really hard to not yell out "F*#K!"